Dalliance is designed to make it easy to add your own data, or data from public collections. There are currently two different approaches for adding data: DAS is rich and flexible, but requires you to run your own server. Binary formats are less flexible, but easy to set up. We expect to support more file-based formats, including VCF and GFF, in the near future. Dalliance is a Distributed Annotation System (DAS) client, so you can add arbitrary data by running your own DAS server. DAS is still the richest and most flexible way to add data, although other approaches (see below) may be easier and perform better for large datasets. Once your server is set up, you can either add the track directly using the Add track -> Custom option, or you can add it to the DAS Registry, in which case it should show up in the track browser directly. Dalliance includes a full implementation implementation of the DAS/1.53 and DAS/1.6 stylesheet systems, and this is the preferred way for controlling how your data appears. Dalliance can integrate data from certain types of indexed binary file directly, without any software support beyond that provided by normal web servers like Apache HTTPD. 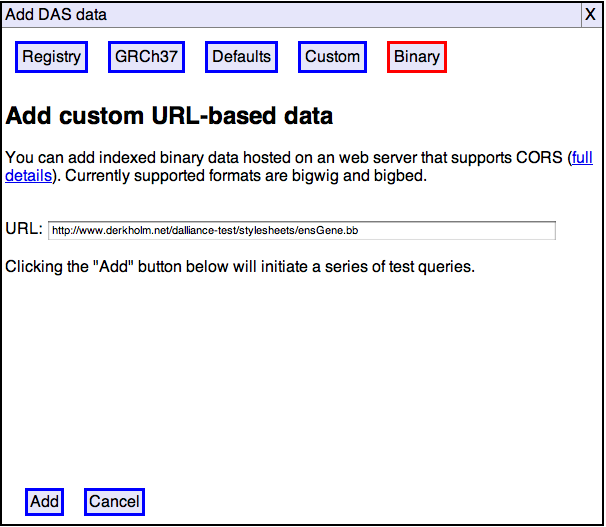 Indexed binary data can also be viewed directly from disk, with no server requirements whatsoever. This is potentially the easiest way to add your own data to Dalliance. It may also have performance advantages over traditional DAS, especially when you have larger numbers of features or a slow network connection. Because these formats have a relatively compact index data structure associated with the primary data, Dalliance can access the index and only fetch the required data, even though data covering the whole genome is combined into a single file. The great majority of modern web server software can return arbitrary portions of a requested resource (using the Range header to specify the desired portion). (You can skip this if you are only interested in accessing local files). The first line is the standard header for enabling cross-origin requests. The second is slightly more subtle: by default, cross-origin requests are restricted to simple HTTP requests without custom headers. The extra CORS header means that Dalliance can initiate requests which use the Range header in order to fetch just a small portion of the data. Ask the server administrator to enable .htaccess files and ensure that custom headers can be configured (briefly, this requires that mod_header be loaded, and that ”AllowOveride FileInfo” be configured). Place the ”Header set” directives in the global configuration file instead. They can be placed inside a Directory section if you do not wish them to affect the whole server. 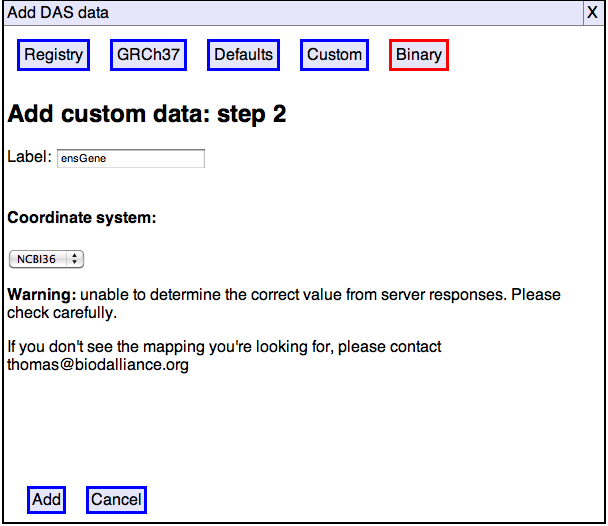 Adding binary data to Dalliance is a very similar process to adding custom DAS data. Click the “Add track” button and then select the “Binary” tab. Enter the URL where your data is hosted, or select a file, then click “Add”. Check the track name and coordinate system, click “Add” again, and you’re done.